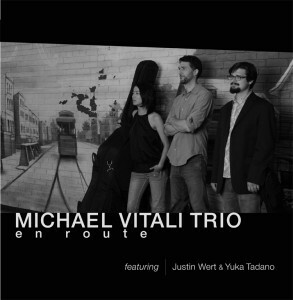 Seattle, Tokyo, and Zurich: Justin Wert, guitar; Yuka Tadano, bass; and Michael Vitali, drums: they hail from all corners of the globe. The three met in numerous, often random musical situations – at Haitian gigs, playing acoustic Mexican music and, of course, jam sessions – but it wasn’t until Michael brought the trio together in early 2011 for a weekly residency at a low-key Upper West Side joint that he recognized their rare chemistry. Playing in an oddly shaped room in an acoustic setting served them in developing a dynamic interplay. While each member is a tasteful improviser, together they found a unique balance through their use of space. Their interaction is conversational and supportive, always fresh and spiced with elements of surprise and occasionally even humor. A true sense of trust has grown between them continuing to empower their risk-taking creativity. Over the years the MVT has adopted a long list of standards, often favoring the tunes less traveled and always in search of new and fresh approaches – using unexpected tempi or odd meters. Their recent release, “En Route,” is a collaborative effort, featuring a mix of inspired originals and standards, as well as an intimate rendition of Scatterbrain by Radiohead. Try the Inkwell’s new expanded menu plus soul food selections, fine wines and beers. Your $5 donation supports the musicians and PLG Arts!